Mayor Stephanie M. Burke is excited to announce that Bill Blumenreich Presents, Inc. (BBP) has been selected to manage the city-owned Chevalier Theatre in Medford. For nearly 10 years, BBP has operated the Wilbur Theatre in Boston, progressively enhancing the venue’s national profile by booking hundreds of shows each year featuring live music, comedians, and speakers. BBP owner, Bill Blumenreich, has over 30 years of experience in the entertainment industry and has worked with a diverse array of performers including musician Rod Stewart, comedian Tracey Morgan, and speakers such Joe Biden, scheduled to visit the Wilbur in January. Two candidates submitted proposals in response to the City’s RFP released in April of 2017. The purpose stated in the RFP was to secure an entity to effectively manage, operate, maintain, and make improvements to the 1,800-seat Chevalier Theatre, programming regular quality events and performances attracting a wide audience. Proposers were thoroughly vetted by an evaluation committee consisting of Chevalier Theatre Commissioners John Costas, Mike Oliver, and John Veneziano; as well as Allie Fiske, Business & Cultural Liaison in the Mayor’s Office; Ann Marie Irwin, City Treasurer; and City Solicitor Mark Rumley. The contract with BBP will span 5 years. In that time, the company plans to make various improvements to the theatre. 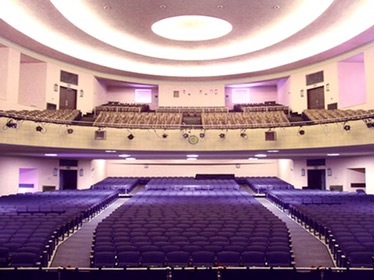 Projects will include improving seating sight-lines, installing a state-of-the-art sound and lighting system, and enhancing the overall internal look of the theatre. The Chevalier Theatre, located at 30 Forest St., was built in 1939 as part of the Medford High School complex as a Works Progress Administration (WPA) Project. In 1940, the theatre was dedicated to Godfrey Chevalier, a resident of Medford who attended Medford High School and who distinguished himself in World War I as a naval hero and aviation pioneer. The Chevalier Theatre Commission – a City entity – was formed in 1980 to revitalize the theatre after a fire destroyed the high school in 1965 and damaged the theatre.